There are many hard conjectures in graph theory, like Tutte’s 5-flow conjecture, and the 5-cycle double cover conjecture, which would be true in general if they would be true for cubic graphs. Since most of them are trivially true for 3-edgecolorable cubic graphs, cubic graphs which are not 3-edge-colorable, often called snarks, play a key role in this context. Here, we survey parameters measuring how far apart a non 3-edge-colorable graph is from being 3-edge-colorable. We study their interrelation and prove some new results. Besides getting new insight into the structure of snarks, we show that such measures give partial results with respect to these important conjectures. The paper closes with a list of open problems and conjectures. 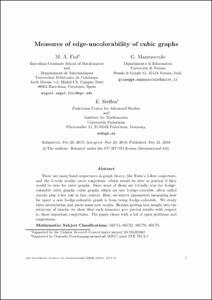 Fiol, M., G. Mazzuoccolo, E. S. Measures of edge-uncolorability of cubic graphs. "Electronic journal of combinatorics", 21 Desembre 2018, vol. 25, núm. 4, p. 1-35.